How do you write a thriller when everyone knows the ending? This was the question that dogged me over the five years of writing my latest thriller, Traitor’s Gate. It’s a reasonable question. However interesting the plot, however fascinating the characters, a thriller must have suspense. The reader is desperate to know what happens in the end, and that is why she whizzes through the pages. The problem with Traitor’s Gate was that because of its premise, the very core of the story, the reader already knew what happened. Hitler did not die in 1938. So why chose such a dumb premise, you may ask? It’s certainly something I asked myself over those painful years of creation. But there was a reason: it was a bloody good story. I wanted to write a spy novel set some time before the outbreak of the Second World War, and I stumbled across a fascinating episode, which I had never heard of. In 1938, a group of German generals and young officers decided that Hitler was a monster who was going to force their country into a war they would lose. So they planned to topple him. And, on 27 September, they came really close. Hitler had threatened to order the invasion of Czechoslovakia that day, thereby starting a world war, or so the plotters believed. What happened (and here we are dealing with history, not fiction), is that on this day the generals commanding the Wehrmacht divisions around Berlin were poised to march on the capital and arrest the SS units stationed in the capital. A potential Prime Minister, Hjalmar Schacht, was lined up to take Hitler’s place. A group of 30 young officers were stationed in flats in Berlin, ready to enter the side door of the Reich Chancellery and arrest Hitler. One of them, Captain Heinz, was under orders to kill him. They were all ready to move at 2pm on 27 September. And then at noon the message came through to Hitler, via the Italian ambassador, that Chamberlain wanted to meet him and discuss handing the Sudetenland over to Germany. Hitler hesitated and then called off the invasion. And the plotters were stood down. The really interesting fact, intensely frustrating to think about even now, was that Chamberlain knew all about the plot. He knew that if he stood firm on Czechoslovakia a group of generals would overthrow Hitler. But he went ahead with the Munich Peace Conference anyway, just to be able to wave that scrap of paper and proclaim “peace in our time”. He knew about the plot, because a young British journalist in Berlin named Ian Colvin had acted as an intermediary between the conspirators and the British government. So, it’s a great story. I did the research. I wrote the book. My hero, Conrad de Lancey, took the role of Ian Colvin. He had a friend from Oxford in Berlin, Lieutenant Theo von Hertenberg of the Wehrmacht. There were lots of twists and turns. But at the end of the book, Hitler lived. No matter how many drafts I took, no matter what scenes I cut, what stunning revelations I unveiled, Hitler remained alive. And the book didn’t quite work. I showed a friend a late draft, I think it must be the fifth one. He is a distinguished playwright, and has also won an Oscar, so he knows what he is doing. He pointed out the problem, but then he also came up with the solution. What about a diary entry at the beginning, or a letter? Something that made the reader look ahead to the ending with some uncertainty, even fear. By the time you receive this letter he will be dead. The newspapers will say that his assassin was an unknown German officer. It wasn’t. It was me. It is quite likely that I will also be dead. So I want to explain to you why I killed him. When I was a boy you taught me that war is wrong. I listened to you then, but it was only when I had lived through eight months of hell in Spain that I knew what you meant. War is coming, and we have both seen how horrific modern war can be. Millions will die: this time it won’t be just the young men, it will be the children, the women, the old, the innocent. I am an historian, trained to analyse economic and social causes for everything, but if ever in history there has lived an individual who through the force of his own will can destroy a continent, it is he. He is evil and he must be stopped: I am fortunate to be able to stop him. I remember once we were on Yarmer Hill, overlooking Chilton Coombe, I was perhaps fourteen. You told me that my life would be a success if I left the world a better place than I found it. Well, I’ve tried to make a small difference over the last few years in Oxford, in Spain and now in Germany, and most of the time you and I have disagreed over my methods. But I hope, I pray, that in this last act I will have succeeded. For all kinds of political reasons it is best that my identity be kept secret; I can trust you to do that. But I need you of all people to know what I have done. Please give my love to Mamma and to Millie, I am sure they will understand. And to Charlotte and Reggie, of course. It’s pretty obvious to the reader that the “he” in the first line is Adolf Hitler. And it’s also pretty obvious that at the end of the book Conrad is going to try to kill him. What isn’t at all obvious is whether Conrad survives. In fact it sounds pretty likely that he won’t. I won’t tell you the ending. I won’t even tell you if Hitler does die, or not. But I will tell you that with this thought deeply buried in the reader’s mind from page one, those final pages speed by in just the way they should. I just wish I had figured it out four years earlier. 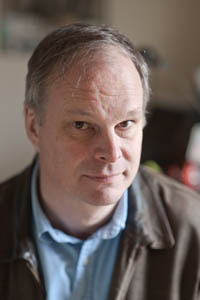 Michael Ridpath used to work in the City before becoming a writer. He has written eight financial thrillers and the Fire and Ice series of crime novels featuring the Icelandic detective Magnus Jonson. 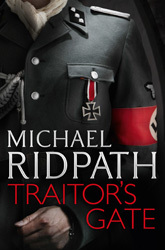 Traitor’s Gate, his twelfth novel, was published in June 2013 by Head of Zeus. He lives in North London. Photo www.chrisgeorge.com .